Badger Daylighting™ understands the tremendous importance placed on maintaining work-site safety and the integrity of underground infrastructure for the Oil and Gas industry. Our non-destructive pipeline excavation is critical to the safety, repair, and maintenance of oil, gas and petrochemical facilities for pipeline crossings or pipeline tie-ins. 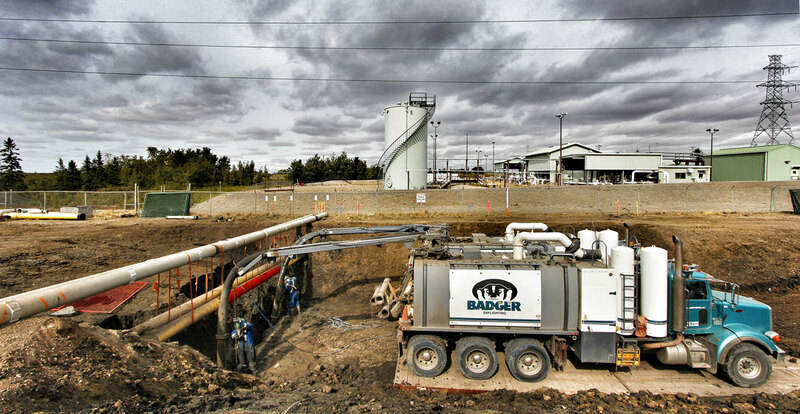 The Badger Hydrovac’s speed and non-destructive characteristics make it the right choice for excavations of any size. With accurate locates, a Badger vacuum truck Operator can daylight a pipeline buried 8’ deep in 10 to 30 minutes. On the other hand, excavate up to 5yd3 in an hour with a precise slop to create a safe workspace. Another advantage of our Badger Hydrovac System is the ability to keep a pit dry of ground water for service technicians, trades and inspectors.